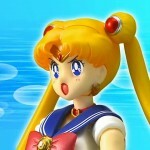 A few web sites have posted news about a rumour of a new Sailor Moon video game for the Nintendo 3DS game. I feel that it’s necessary to be specific about just how prelimenary this information really is. 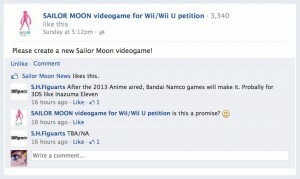 All that has happened is that “SAILOR MOON videogame for Wii/Wii U petition“, a Facebook group trying to petition to have a new Sailor Moon game made, made this post on the S.H. 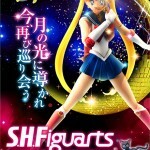 Figuarts Facebook page asking them to create a new Sailor Moon game. Their answer was “After the 2013 Anime aired, Bandai Namco games will make it. Probally for 3DS like Inazuma Eleven“. Keep in mind of course that S.H. 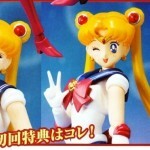 Figuarts is a line of toys, including the new Sailor Moon figure that Bandai is releasing in August, and that they are not responsible for creating video games. Whether they have inside information about Bandai’s plans to create a 3DS game or that they are simply speculating about the creation of such a game is not clear at this point. When asked for more information they simply stated it was to be announced. 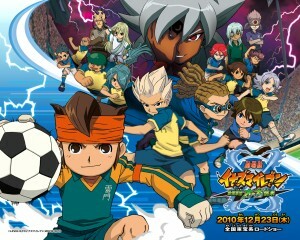 Why it’s mentioned that the game is going to be like Inazuma Eleven, a series of RPG soccer games is a bit of a mystery to me. That sentence could simply mean that like Inazuma Eleven, the game will be released on the 3DS. This entry was posted in Video Games and tagged Bandai, Nintendo 3DS, S.H. 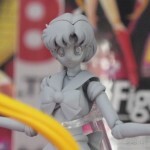 Figuarts by Adam. Bookmark the permalink. Oh man, what a tease! As rumors go, I’m not going to get my hopes TOO high. 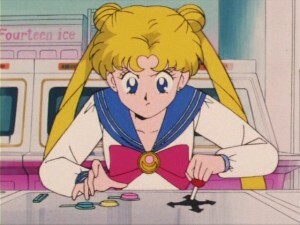 The other day I was thinking about how there are still new DBZ games being made, but no new Sailor Moon games. 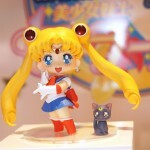 Well, Moon is getting popular again so maybe this is a good sign. Don’t get too excited people. They made the 3DS game for the new Thundercats series as well, and it was terrible. Yeah, it was a generic side scrolling beat ‘em up style game where it really did look like they had the entire game engine built and ready to go, and then just made Thundercats sprites to skin it with. Classic “We need a game for this in 3 weeks” kind of deal. The Thundercats game was NOT for 3ds. That was for old DS. And I picked it up pre-owned for $5 at Walmart yesterday. This post is fairly old. By now I don’t think a 3DS game would be that likely given the age of the system. If they made a game it would likely be on Switch but since there hasn’t been any news in nearly 5 years this particular rumour doesn’t seem to have gone anywhere.